The ENT doctor will carefully examine your neck to determine if the lump is a lymph node, thyroid nodule or some other lump. 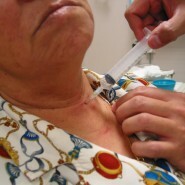 He will usually insert an endoscope through the nose to look for a growth if it is a lymph node. With the endoscope, he can also check for the movement of the vocal cords which may be affected with thyroid cancer. He may do blood tests to check the thyroid function, ultrasound scan and do a fine needle biopsy to exclude cancer. If in doubt, he will recommend surgery (removing half the gland) with frozen section while the patient is asleep (under anaesthesia) to exclude cancer. He will usually proceed to removing the entire gland if it is proved to be cancerous. Sometimes a neck dissection is carried out to remove lymph nodes.